Armed with the new camera I got for Christmas and the promise of a warm sunny day we set off for Meadowvale Conservation Area in Mississauga. We have previously written about much of the history of the conservation area from the perspective of the various dams and berms associated with Silverthorne’s grist mill. We won’t cover that again here and the link will be supplied again at the end of this story. Today we were interested in the western side of the conservation area where the Guelph Radial Line used to run. The Toronto Suburban Railway operated 5 electric commuter lines, including the one that ran up Yonge Street known as the Toronto & York Radial Railway The line to Guelph was the longest in the system at 49 miles. Stop 47 was a small station in Meadowvale after which the line crossed the Credit River and ran through the property that would become the conservation area. When visiting the conservation area in the 1990’s there was quaint little suspension bridge that carried the pedestrian trail across the Credit River. It was demolished in 2009 leaving only the metal posts on the river bank. A decaying sign in the woods announces the removal of the bridge but it isn’t really needed any longer. To see a picture of what the bridge looked like you can follow this link to a similar bridge in Warden Woods. My new camera allows me to get much better shots of birds and the cardinal in the photo below was only a small red spot to the naked eye. I think I’m going to like having it along. The new bridge is a little farther south and considerably longer. It crosses an area that is likely under water when the river is flooding. From the west end of the bridge there is a line that can be seen running horizontal through the woods. This is the right of way for the former radial line. The official opening of the railway came on April 14, 1917 and soon trains were running between Lambton and Guelph every two hours. The trip lasted two and half hours and was very popular until the early 1930’s. Rising costs, poor profits and a string of accidents coupled with a new love of the automobile led to the line being closed in August of 1931. The tracks were removed in 1936 and in many urban areas the line has been built over with housing developments. 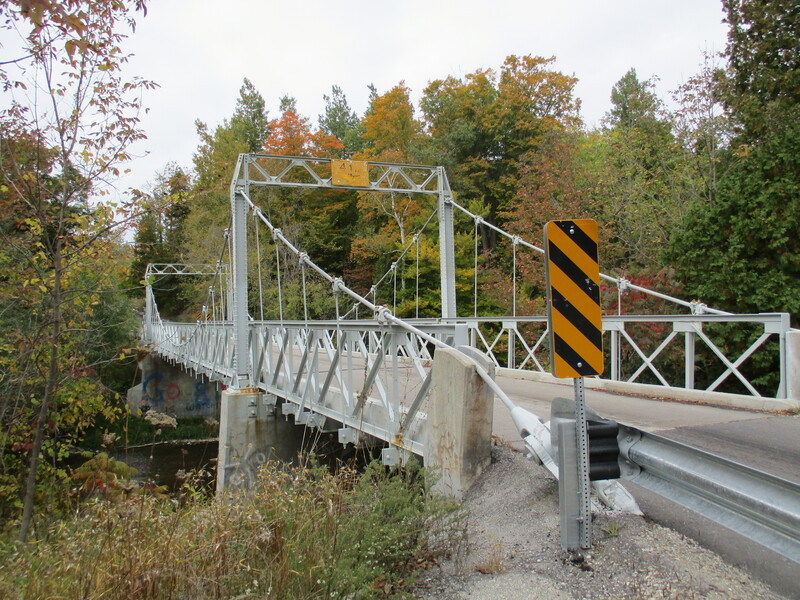 The bridge that carries Old Derry Road over the Credit River was built in 1948. 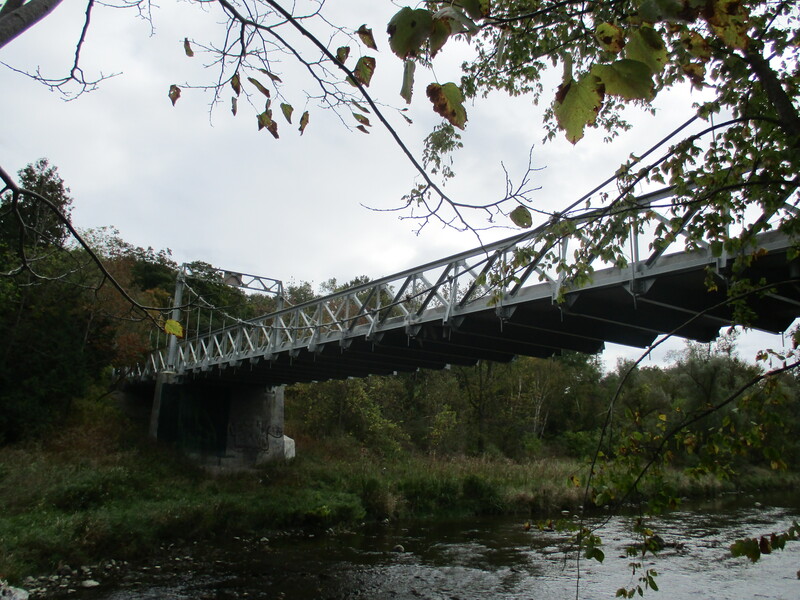 It is known as a camelback truss bridge and is part of the Meadowvale Cultural Heritage District. The tail race for the Silverthorne grist mill joined the river just north of the bridge. The tail race was crossed by the radial line near the last house on Willow Lane. Both of the abutments are crumbling after 100 years with no maintenance. This picture was taken at the time we explored the side of the conservation area with the mill foundations in it. The abutments for the crossing of the Credit River are still easy to locate a short distance north of the truss bridge. The picture below shows the south abutment as seen from across the river. The last house on Willow Lane is undergoing a restoration. The south abutment can be seen in the lower corner of the picture and the abutments for the crossing of the tail race are basically in the front yard. With frequent passenger and cargo service this must have been a great place for train enthusiasts or a noisy place for anyone else. The abutment on the north side of the river has become completely overgrown with vines and must be all but hidden in the summer when the grass is full height. Behind the vines the century old concrete is crumbling badly. Where the radial line ran through the park there are still about ten of the old electric poles standing. The poles supported an overhead caternary system that delivered 1500 volt DC to power the cars. They can be picked out because of their straight lines and flat tops. In several cases the pole has a blue slash on it as can be seen on the extreme left in the cover photo. Fungus can still be found in the winter and it often adds colour and interesting patterns to what can be an otherwise drab landscape. These turkey tail fungus entirely surrounded this old stump. The intersection of the radial line with the active Canadian Pacific Railway appears to lie somewhere under the six lanes of the new Derry Road. North of Derry, the Samuelson Circle Trail continues on the old right of way. 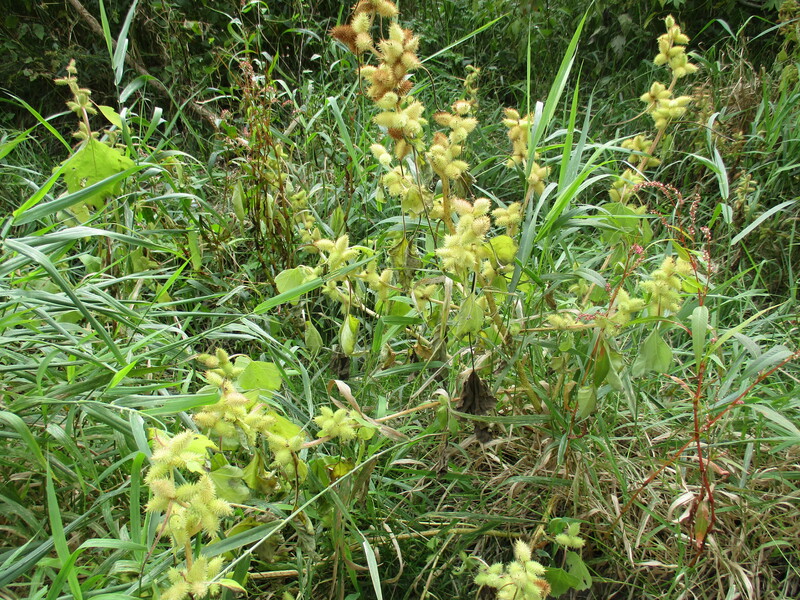 The berm can be identified in many places along here because it rises a couple feet above the surrounding land. Culverts allowed drainage from one side of the berm to the other and one can be found in this section. Cinnabar-red polypore can grow p to 14 centimetres in size and those pictured here are some of the larger specimens. 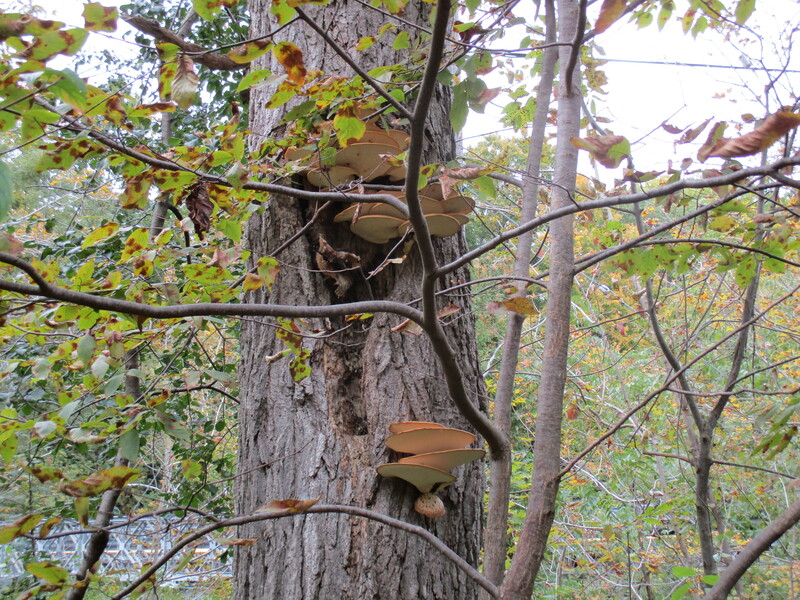 They grow all year and some will produce spores in the second and third years. This fungus is not edible. Meadowvale Conservation Area is full of interesting historical artifacts for those who like to look for such things in the area in which they are hiking. Many of these are associated with the Silverthorne Grist Mill which we covered in detail in a previous blog. The Guelph Radial Line has left only a few clues to the former right of way as it passed through the GTA. A ghostly set of piers that cross the old mill pond in Limehouse is one example of interesting place to visit. This entry was posted in Credit River, Uncategorized and tagged cardinal, Credit River, Google, Guelph Radial Line, Meadowvale Conservation Area, Turkey tail fungus on January 5, 2019 by hikingthegta. The remains of a ghost town lie along the Humber River on Duffy’s Lane just north of Bolton. The property of George Elliot on the county atlas below was in the Elliot family from 1855 until 1929. During this time a few homes were built along Duffy’s Lane with views of the river. Only two are shown at the time the atlas was drawn in 1877. By 1909 there were half a dozen homes with a small community forming around the bridge over the river. In 1929 the 100-acre half lot was sold to Bertram Realty Company who planned to capitalize on the quiet setting along the river. They divided the land into small parcels and started selling them for cottages. People began to buy the lots and build on them and by the early 1950’s there were enough children support the construction of a new school at the corner of King Road and Duffy’s Lane. In October 1954 Hurricane Hazel hit the GTA killing 81 people and changing the way we managed our floodplains. Local conservation authorities across the GTA began to buy properties and remove houses that were considered at risk. They also developed a plan that called for the construction of 15 major flood control dams and reservoirs including one on the Humber River just north of Bolton. Of these dams only Claireville, G Ross Lord and Milne Dam were constructed. The Glasgow dam would have been 29 metres high and Humber Grove would have been under the new flood control lake. Slowly the houses were moved or demolished until by 1977 there were no buildings remaining. Duffy’s Lane is exactly that, their original laneway. This is what is known as a “given road” because it is not part of the original grid of the township survey. It is a privately constructed road, on private land, that was given for the use of the public. For reference, Duffy’s Lane has been coloured brown on the map above. The Duffy house was built in the 1840’s and has been given a historical designation by the township of Caledon. It is seen in the picture below and marked with a red arrow on the map above. Duffy’s Lane has had many alignments in the area where Humber Grove was and there have been at least four bridges over the river. 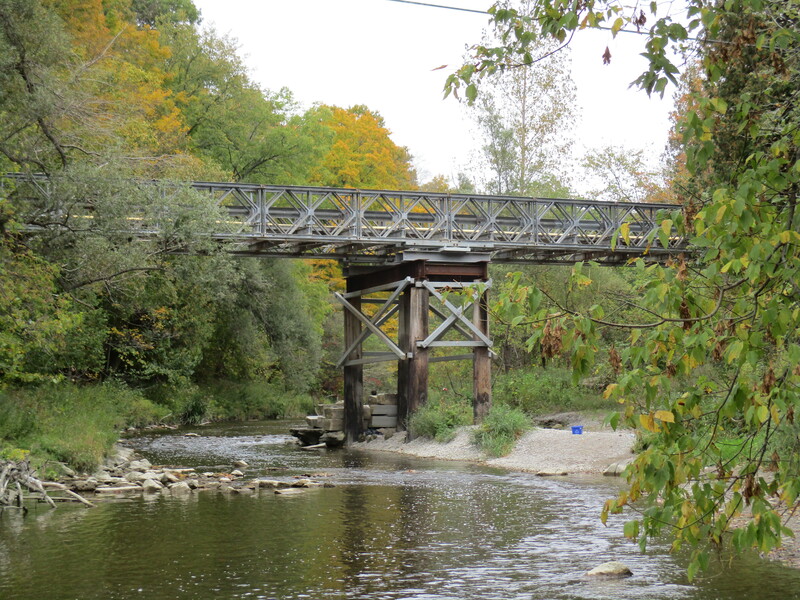 The county atlas above shows a bridge over the west branch of the Humber River that predated the use of poured concrete for bridge construction by 20 to 30 years. Therefore, the abandoned bridge in the cover photo has to be at least the second bridge at this location. The picture below shows the abutment for the old bridge in the lower right corner. This bridge was likely built at the time that a subdivision plan was put forward in the 1920’s. A new bridge would have been helpful in persuading people to buy a lot this far outside of Bolton. On the left in this picture are two newer bridges, the lower one from 1985. In 2013 work began on the Emil Kolb Parkway as a bypass to keep the increasing flow of traffic from going through downtown Bolton. The new multi-lane bridge was built in 2014 and the older one converted to a pedestrian trail. It is likely that some of the original Humber Grove foundations were lost during the construction of these various bridges. Milkweed pods have started to break open exposing their seeds to the wind. Each tiny, flat seed is carried on the breeze by hundreds of tiny filaments attached to it. Milkweed is essential in the lifecycle of the monarch butterfly. There were many of these orange beauties flying around and it seems like it is late in the year for them. This is the fourth generation of monarch born in Ontario this year and it is programmed to fly to Mexico to spend the winter. The example in the picture below is a female because it lacks the two little black dots on the hind wings that mark the male scent glands. Throughout the woods, there are several obvious laneways, most often marked with a double row of trees that lined either side of the old roads. In a couple of places, there are old hydro poles in the woods that have the wires cut from them because the homes they once served no longer exist. At the end of the laneway above is an obvious clearing where a house once stood. The back end of the property has been reinforced with a concrete wall. A garter snake was sitting on a fallen branch taking in the late October sunshine. These snakes don’t actually hibernate unless they are in a climate where it goes below -40 Celcius. In reptiles, hibernation is normally referred to as brumation. In most cases, the garter snake is awake through the winter with a 77% reduced heart rate and minimal oxygen intake. The original alignment of Duffy’s Lane can still be found running north from the earlier bridge abutments at the river. Former laneways extend into the woods along the sides of the road. We found an old concrete foundation a few feet into the first of these laneways. The woods have been regenerating for 40 years and most of the former entrances can only be made out due to the parallel rows of mature trees that line either side. Old fence lines mark the edges of the various properties that used to line both sides of old Duffy’s Lane. The boletus family of mushrooms includes over 100 varieties, many of which are edible. They can be distinguished by the tubes that carry the spores under the cap rather than the gills that can be found on many other types of mushrooms. Make sure that you never touch or eat any mushroom that you cannot positively identify. There are often similar looking species where some are edible and some are poisonous and can kill you. There is a lot of tall grass, dog-strangling vines and undergrowth throughout the area. There are plenty of foundations remaining to be found, perhaps when there is less foliage. Humber Grove can be accessed from the Humber Valley Heritage Trail. We explored part of this trail in a previous post called Humber Heritage Trail Bolton. The Toronto Region Conservation Authority has an informative article on Humber Grove with historic maps that can be found here. This entry was posted in Humber River, Uncategorized and tagged Duffy's Lane, garter snake, Google, Humber Grove, Humber River, milkweed, monarch butterfly on October 21, 2017 by hikingthegta. The Rouge River flows between two historically significant bridges in Scarborough. I decided to try to hike the river from one to the other. I parked on Sewells Road a little north of the suspension bridge. It was a nice fall day with temperatures in the “no bug” zone of 12 degrees. Frank Barber (1878-1945) was a civil engineer who designed several bridges in Toronto including the Middle Road Bridge (1909) and the bridge at the Old Mill (1916) both of which were visited in previous posts. In 1912 he designed the suspension bridge across the Rouge River on Sewells Road. At the time, Toronto was expanding and access to new parts of the city was restricted by the deep ravines of the Humber, Don and Rouge Rivers. This was one of the early bridges to provide a permanent crossing to the river in this area. Suspension bridges are normally a solution for major waterways or wide valleys but this one is just 160 feet long. The bridge deck is concrete suspended 13 feet above the river by two cables securely anchored into the ground on either end. The cables are seen in detail in the cover photo. These cables bear the load of the bridge which is suspended on hangers or vertical rods. Barber completed the bridge in 1912 and it was restored in 1981. It is one of only a few suspension bridges in Ontario and the only one in Toronto. It is also one of 15 bridges listed as heritage properties by the city. 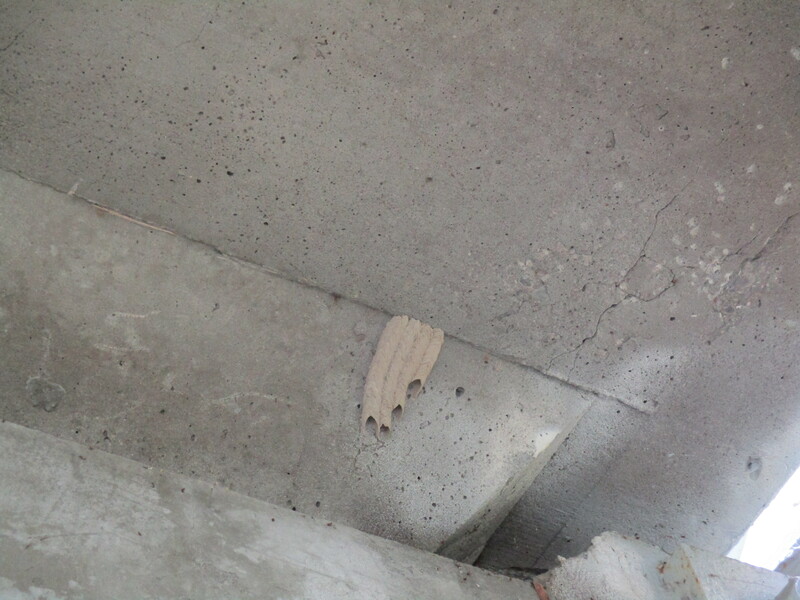 Under the bridge is the distinctive nest of the organ pipe mud dauber wasp. This is an unusual wasp in that the male stands guard at the nest while the female gathers food. One of the main food sources is spiders. The wasps are about an inch long and as such are the largest of their species. Also under the bridge is the Google logo which is a rare example of graffiti that can actually be read. Rough Cockleburs grow along the side of the Rouge River. This member of the aster family doesn’t have the usual wind blown seeds. Instead, it spreads through seeds that grow inside of oval heads that are covered with spines. They get caught in animal fur and clothing and can be carried long distances. The cocklebur is also related to the sunflower and daisy and has been used for it’s anti-inflammatory and antimicrobial properties. I had chosen to try to follow the west side of the Rouge because a thirty foot sand bank on the east side of the river can be seen from the road. 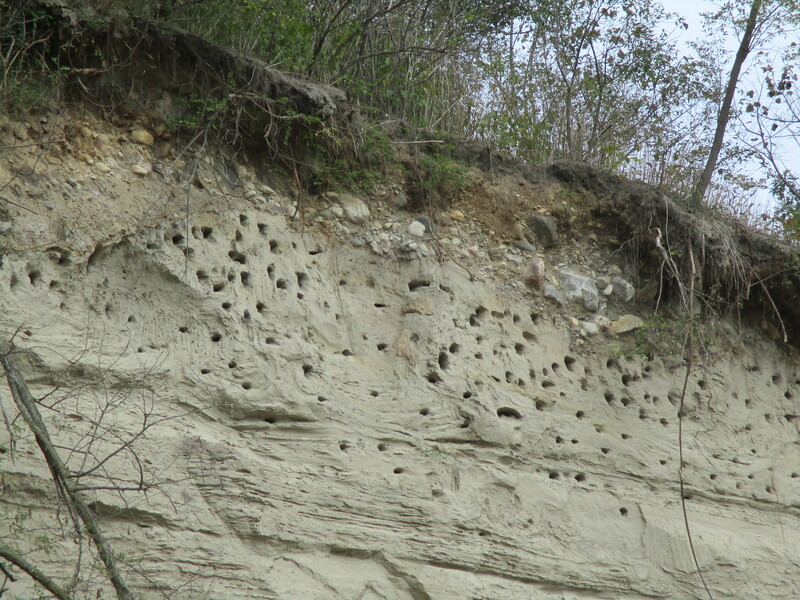 As you get closer you can see that there are hundreds of Sand Martin holes along the edge of the cliff. These birds dig winding holes into the side of the sandbank where they are difficult for predators to reach. There is a large breeding colony living in this embankment. After disturbing a Great Blue Heron and traversing a mess of poisonous wild parsnips I discovered that there is an even taller sand bank on the west side. It may be possible to pass on the edge of the river, but not when hiking alone. The strip along the water’s edge is made of material that has fallen down the face of the sand bank and may not be very stable in spite of the thin vegetation growing on it. My attempt to make my way downstream to the second local bridge of interest wasn’t successful and so I moved my car to the Rouge Park Finch Meander Area parking lot. Near the parking on Old Finch Avenue is a tree with a large number of artist conks growing on it. They can be picked and the white underside scratched to produce pictures or writing which turns brown as the conk dries. The surface then becomes hard and the artwork is permanent. On October 15, 1954 Hurricane Hazel landed in Ontario bringing heavy rain and strong winds and taking 81 lives in it’s wake. Rivers across the GTA flooded and bridges were destroyed or damaged on every major waterway. Sections of the city were isolated and traffic flow was severely affected. To get people moving again the army was called in to help build temporary bailey bridges. Only one of these remains in service in Scarborough and it is the one on Old Finch Avenue. It is 130 feet long and, along with the wood piers in the middle, was constructed by the 2nd Field Engineer Regiment in just 3 days. 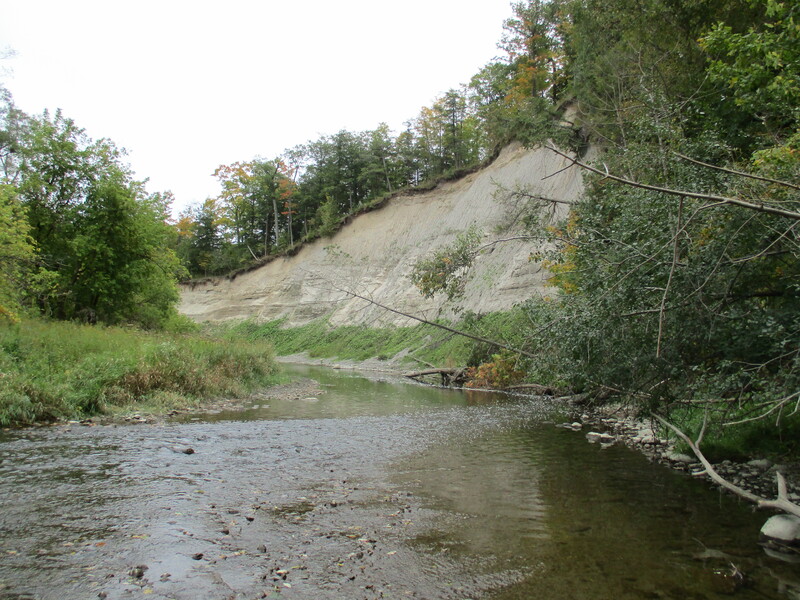 This entry was posted in Rouge River and tagged artist conk, bailey bridge on Old Finch Avenue, cocklebur, Google, organ pipe mud dauber wasp, sand martin on October 8, 2015 by hikingthegta.